Almost all modern circuits are sensitive to power quality, which to a large extent is a measurement of the power rail impedance. This is because flat impedance power rails result in much lower noise than power rails that aren’t flat. In RF circuits the peaks generally result in increased phase noise, while in digital circuits the issues are related to the allowed voltage window for the ASIC’s. In high-speed transceivers, these peaks result in jitter, which is also related to phase noise. In analog circuits, the peaks can result in increased noise density and in analog to digital converters the peaks result in spurious responses. The power rail impedance is typically controlled by the careful selection of bulk aluminum or tantalum capacitors, ceramic decoupling capacitors, inductors, and ferrite beads. 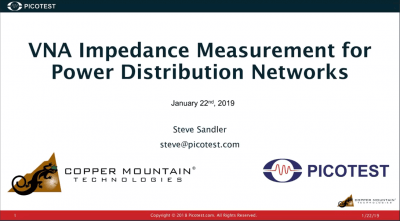 The instrument of choice for these impedance measurements is a vector network analyzer and the most common and highest accuracy measurement is the 2-port shunt through technique, using a 2-port VNA. The VNA offers the excellent dynamic range and also wide bandwidth. Please register below to receive access to this on-demand webinar.